Looking for healthy and sustainable building products? BuildingGreen’s got you covered. BuildingGreen’s independent team of editors has compiled guides to more than 100 product categories, to help you learn what to look for when selecting green products that avoid negative health impacts. You can browse our guides below. If you just want answers without having to do all the research, check out our Product Vetting services. We’ve already done the work, so we know what to look for in every category (and what to watch out for). Save time and budget by hiring our product experts. Watch this brief (and delightful!) video to learn about our green product listings. Our editors have evaluated thousands of building products—see them all on our partner site, Designer Pages. Access to Designer Pages green product listings is available to BuildingGreen Premium members. You’ll have access to more than 100 curated collections containing the best green products out there—along with some collections warning you which “ungreen” products to avoid. Confused about material choices for LEED v4? Overwhelmed by data on material ingredients and impacts? Let BuildingGreen guide you to the products you need and give you the tools to explain those choices to colleagues and clients. 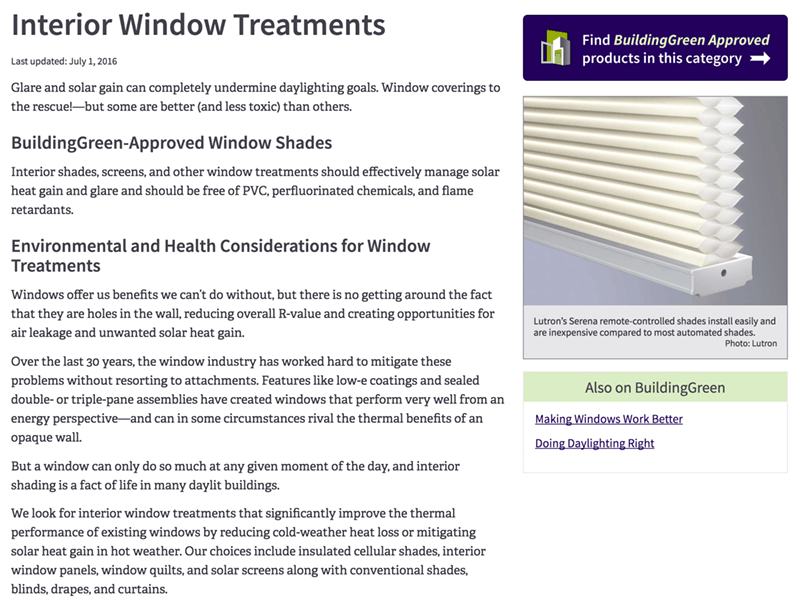 Activate the BuildingGreen filter while browsing products in Designer Pages, and you’ll see only the best-in-class products that meet our strict sustainability requirements. Our independent team (BuildingGreen takes in no advertising fees) carefully reviews each product so you can be confident the results are greenwash-free. 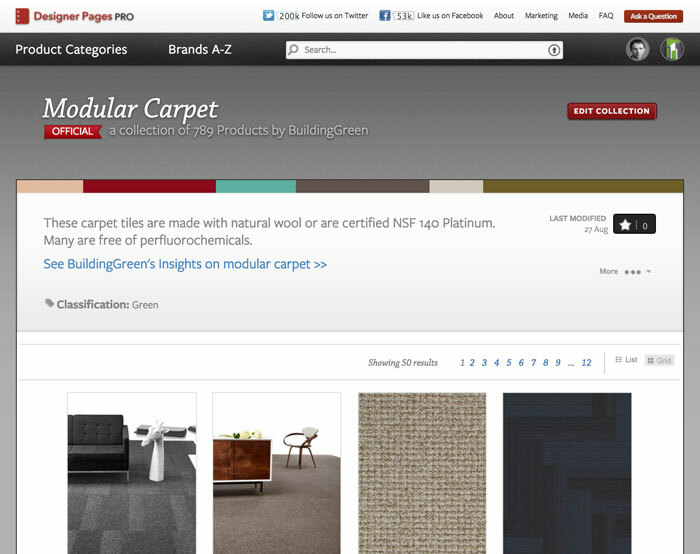 You’ll see the BuildingGreen filter while browsing through product categories on Designer Pages. You’ll see our editors’ take on every product in our green collections, along with a list of applicable LEED credits. We also vet health and environmental product declarations when available. An executive summary of BuildingGreen’s criteria in each product category is just a click away, along with access to deeper resources. You’ll get the context of our top experts as you effortlessly choose products with the design features you need.